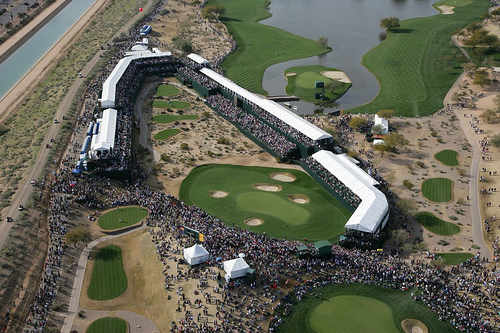 The Phoenix Open played from 4th to 7th February at TPC Scottsdale (Tom Weiskopf and Jay Morrish design) is now taking place. And does that not remind you of one of the most famous aces in the history? The 16th Par 3 at just 162 yards it is a simple 8 or 9 iron for most players but there have only been 9 aces since 1987. You might think that is alot but upto 2012 there have been 10.394 tee shots on the 16th and in that time just 8 aces. This works out to 1 ace every 1,299 tee shots in tournament play.